It will come to a time when it is best for baby and mummy to transit from breast to cup. Your confinement nanny won’t have the chance to see this. Your baby is growing up and he or she is ready to take the next big step. 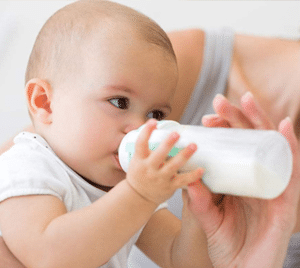 Else, if your baby is not ready for a cup, you may need to transition your child from breast to a bottle. Breastfeeding is an intimate activity for mummy and child. You may have mixed emotions about letting go. By taking a gradual approach to weaning, and offering plenty of love and affection, can help your child make a smooth transition. Weaning does not have to be difficult at all. Simply choose the right time and do what you can to make it a growing experience. When is the best time to start weaning? Well, there really isn’t any right or wrong answer. Breastfeeding until your baby is 1 is recommended. Breast milk contains the right balance of nutrients for your baby and boosts your baby’s immune system. Most find the easiest time to start weaning is when the process is initiated by your baby. Weaning often begins naturally at 6 months which is when solid foods are typically introduced. There are children who gradually start at around age 2 as well, after they have begun eating a wide variety of solid foods. Other children may begin weaning only until their toddler years, when they unable to sit still during breastfeeding. You might consider delaying weaning if your child isn’t feeling well or is teething. He or she will be more likely to handle the transition well if you are both in good health. You may also consider postponing weaning if a major change has occurred at home such as moving to a new home or the addition of a new family member. You don’t want to add more stress of what may already be a stressful time for your child. Some research also suggests that exclusive breastfeeding for at least four months may have a protective effect for children who have a family history of food allergies. If food allergies run in your family, talk to your child’s doctor about the potential benefits of delaying weaning.